This year, I vowed to make better use of my food dehydrator; so far I am off to a great start! Last year, I didn’t begin using it till mid July, but successfully dried blueberries, banana chips, and Swiss chard. I failed at tomato skins. Technically, I didn’t fail, but the results were not what I had expected. Instead of a crispy chip-like wafer, I ended up with leathery plastic pieces… and into the compost they went! This year, I’ve dehydrated several batches of both strawberries and cherries; blueberries will be the next fruit to come into season. I also have plans for tomatoes, melons, peaches, kale, carrots and anything else I can think of! I’ve also decided to better utilize my vast supply of organic herbs growing around the property. Last year I planted Matricaria chamomilla, also know as German or Hungarian chamomile. It is closely related to Roman or English chamomile; however, they are two separate plants. 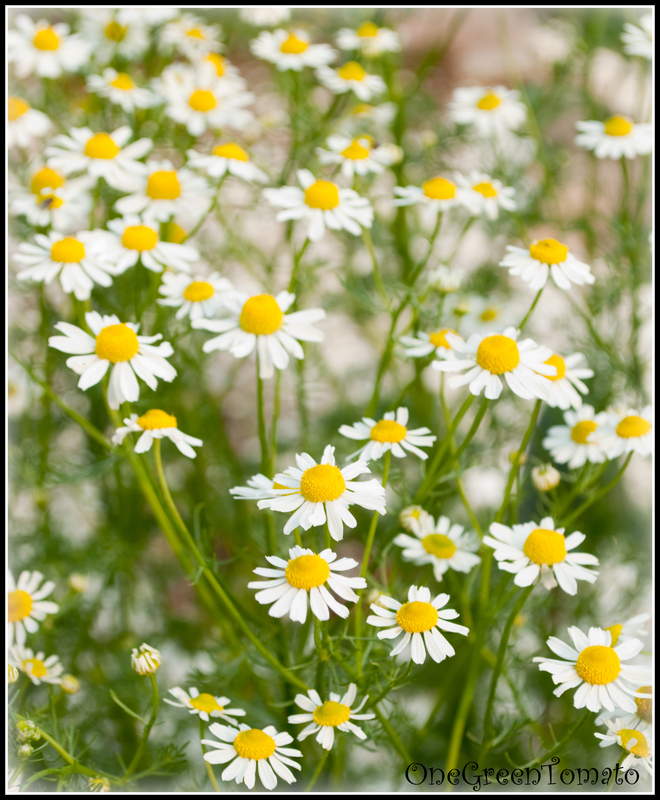 German chamomile is an aromatic annual that grows about 2-3 feet in height and bears small daisy-like blossoms. Roman chamomile is an aromatic creeping perennial that also produces small daisy-like flowers, but grows close to the ground. For centuries, the English have been using it to create scented lawns (like the one found at Buckingham Palace), since it’s resilient to being walked on. Another way to tell the difference between German and Roman chamomile is by the receptacle. Roman chamomile is flat and solid on the inside, whereas German chamomile is dome-like and hollow. Many herbalists use the two chamomiles interchangeably since they have similar properties. 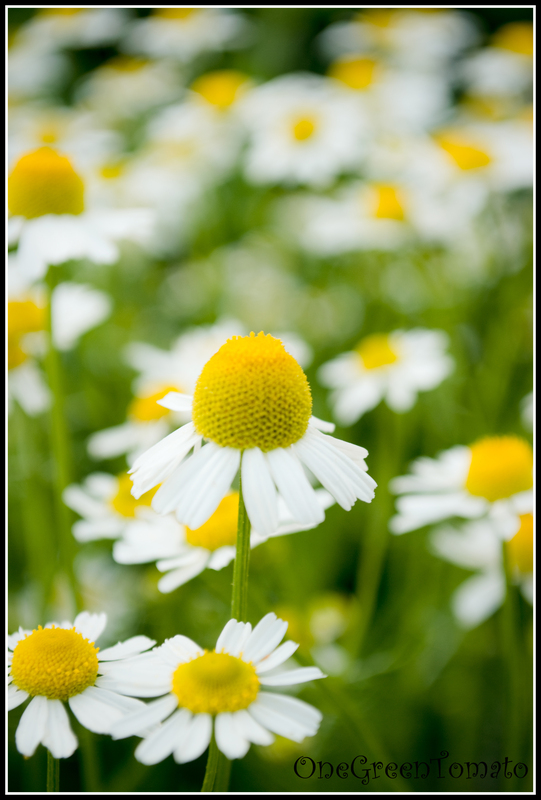 German chamomile, however, is considered medically superior and more potent since it contains more of the anti-inflammatory agent chamazulene. Chamazulene is a highly effective and proven herbal remedy for arthritis, rheumatism, and gastritis. German chamomile is also anti-allergenic, anti-inflammatory, antispasmodic, calmative, carminative, digestive, emmenagogue, mild bitter, nervine, and a sedative. Since I allowed my German chamomile to self seed, it came back (with a vengeance) this Spring. 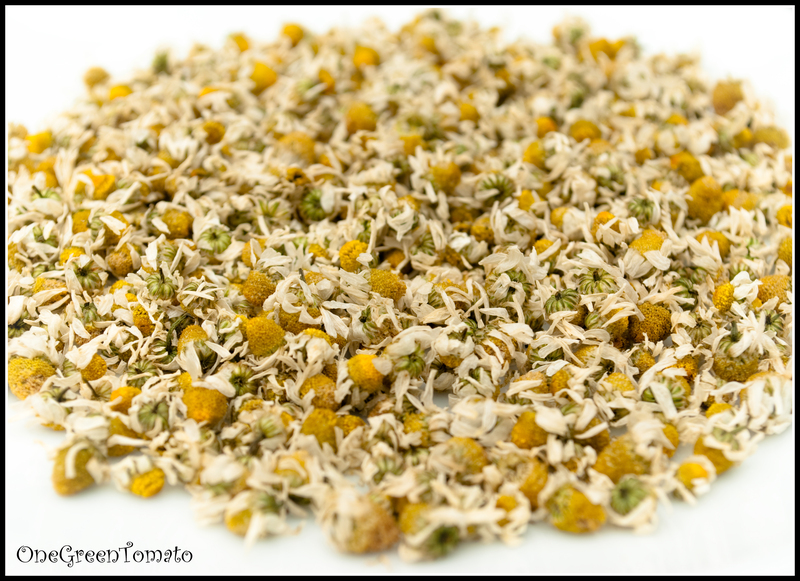 I have more chamomile than I know what to do with… and that is a very good thing! I plan on transplanting some of the volunteers to other areas of the property this weekend. I really enjoy winding down with a relaxing pot of chamomile and catnip tea, so, the bigger my harvest the more tea I can brew! Polonius assisting me with the harvest! 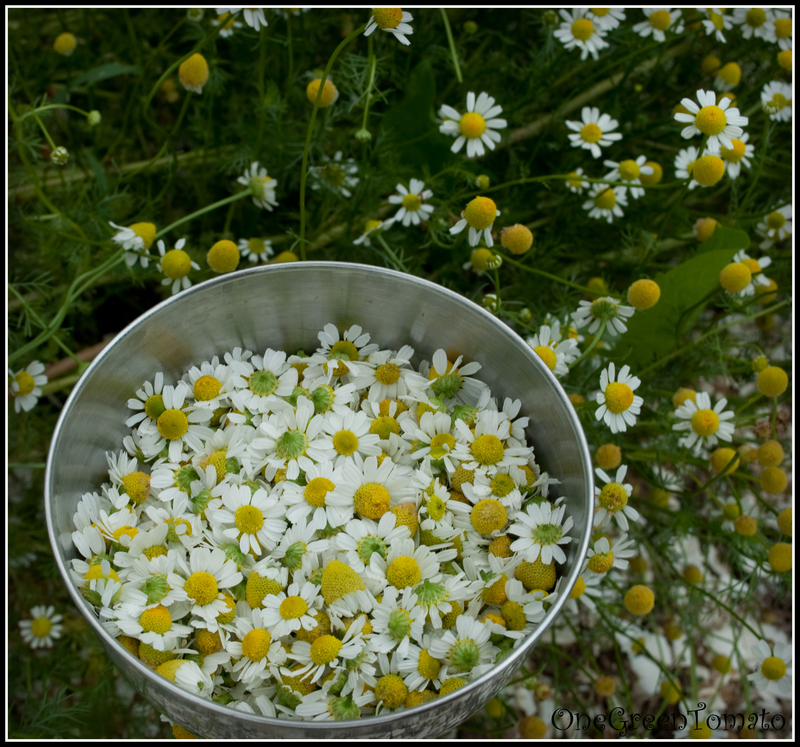 It is recommended that you harvest the chamomile flowers early in the morning after the dew has dried, but before the blossoms have opened. When I started, the blossoms were closed, but they had opened by the time I was done! You can pinch off the flower from the stem, which will encourage rapid new growth, allowing for a continual harvest. Or you can cut the stems, which takes much more time for the plant to rejuvenate. If you cut the stems, tie them together with twine and hang upside down in a warm, dry, and dark place. If you are only cutting off the flowers, which is what I did, you will need a drying screen or a dehydrator to dry them. I used the herb/craft setting on my dehydrator and left it run for about 8 hours. Before placing the blossoms in my dehydrator, I first soaked them in a small bowl of cold salt water for 10 minutes to kill any bugs that may have tagged along for the ride. I think I used 2 tbsp salt. Then I drained the flowers, rinsed them and allowed them to soak another 5 minutes in fresh cold water. Store the dried flowers whole, in an air-tight jar, out of direct sunlight. When making tea I keep my flowers whole, but some people like to crush them. Always crush herbs right before using them. Storing crushed herbs is a sure-fire way to decrease their effectiveness and flavor! I also like to store and preserve herbs for use. And I am surely going to try the preservation of german chamomile also. The procedure and usage sounds good to me. I never thought about using a dehydrator! That seems like it would save so much time and you wouldn’t have to check them! 😀 does that do anything to the effectiveness? Not only does a dehydrator maintain the herb’s aromatic and medicinal properties, you don’t risk the chance of burning them like you would in an oven… unless you have them at the wrong setting of course! Pingback: Natural Herbs To Fight Off Acid Reflux! If the flowers are already drying on the stem are they okay to use. We have had hot dry weather so they are drying quicker than ever. If you don’t own a dehydrator what are some other ways to dry the flowers? You can also dry them in an oven on a very low setting or outside, you just have to be careful they don’t blow away!